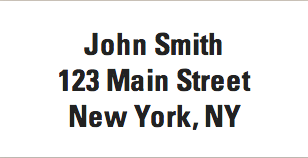 The James Hopp Company is America's first choice for Personalized Address Labels. We were the first to make them in 1939, the first with a national network of dealers, and we are still first in quality, selection, and service. Please contact labels@jameshopp.com for your password. Limit 4 lines. Black Ink only. Fourth line 95 cents extra. Deluxe Label-Ets 3/4" x 2 1/2"
Limit 5 lines. 5 Ink colors. Add free artworks. Mini Label-Ets 1/2" x 1"
Limit 3 lines. Black Ink only. How many characters will fit? The order screen will indicate when the limit is exceeded. Some type fonts fit more characters than others. Try different ones. Your satisfaction is our goal. Please drop us an email explaining the problem. Be sure to include the Order Control Number. We will respond describing corrective action, usually the same day. All orders are shipped First Class US mail. How long does the mail take? Usually 3-5 days, but sometimes as long as 10 days. All orders are shipped separately. Orders placed the same day may arrive on different days. We will never sell your information nor use it for any purpose other than to fill your order. Making labels is our only business. Major credit cards are welcomed. Orders may also be mailed with a check. Change an order already placed. We will try. However many orders are printed within hours of receipt. If you are not satisfied with your labels, return them along with the packing slip and we will refund your money in full.